Looking for a great mystery novel to read – one that you can’t put down? This blog will discuss a variety of favourite mystery and suspense novels, including classic texts. With Halloween approaching, what better author to discuss than the master of suspense and terror – Stephen King. Although he is considered a horror writer, his works are also skilful mystery novels. Indeed in 2007, the Mystery Writers Association recognized King as mystery writer par excellence when they named him a Grand Master. In 2006, the BBC estimated that more than 350 million copies of his books have been sold. His numbers have done nothing but grow. Stephen King graduated with a degree in English from the University of Maine. When asked why he chose a career in writing, he replied, “There was nothing else I was made to do.” In 2003, the National Book Foundation honoured King with the Medal for Distinguished Contribution to American Letters. He has also received 10 Bram Stoker awards, 4 World Fantasy awards, and a miscellany of other honours and awards (click here for a complete list). King has always been a dedicated craftsman, one who revises each book “a dozen times or more” (King 2000, 213). The nucleus of the story is all there in his dream. Paul Sheldon awakens from a coma in Annie Wilkes’s isolated farmhouse. Sheldon is in severe pain with a badly broken leg; he is unable to think clearly because he is being drugged; and he realizes that he is being held captive by a psychotically disturbed individual. This is a book that is truly impossible to put down. What Stephen King excels at is the ever-so-gradual shift from the ordinary to the horrific. Indeed the terrifying is that much more alarming in his novels because it emerges from the everyday. By blurring the boundary lines between the ordinary and the extraordinary, King claims that he takes stories into that “I-hope-this-is-only-a-dream territory where the merely scary becomes outright horrifying” (2001, xvi). In his introduction to The Shining, King claims that “Monsters are real, and ghosts are real, too. They live inside us, and sometimes they win” (2001, xviii). Unlike many of his other novels, there are no supernatural elements in Misery. Annie Wilkes is the “monster” of the novel, and is no less horrifying because she is real. Annie resonates because she is part of us all. When Paul Sheldon tries to imagine that Annie did not commit a series of horrific deeds, he says, “But he knew. The Annie in him knew” (192). In his review for The Boston Globe, Ray Murphy (1987) calls the novel “a gothic horror story [see my post on mysteries and the Gothic] full of twists and turns and mounting suspense.” King knows the secret of successful novel writing. In On Writing, he observes that readers want a story that will fascinate them (2000, 160). Misery is a book that will draw you in and not let go. Dennis, Ian, “The Novelist in Fear of a Large Audience.” The Globe and Mail. June 13, 1987. King, Stephen. Misery. 1987. New York: Signet, 1988. ______. On Writing: A Memoir of the Craft. New York: Scribner, 2000. ______. “Introduction,” The Shining. New York: Pocket Books, 2001. Murphy, Ray. 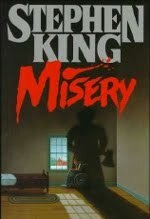 “‘Misery’ is Classic King.” The Boston Globe. May 25, 1987. Clark: Where Are the Children? Clark: Where Are You Now? Mystery Novels: Why Do We Love Them So Much? Print, E- or Audio Mysteries: What's Best?